Ranger is rugged, outdoorsy, on-trend, and yet quite rare. Thanks to Raquel for suggesting our Baby Name of the Day. Like many a surname, Ranger started out as a job. 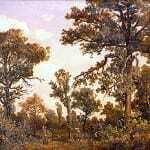 By the 1300s, it referred to a gamekeeper, one who was responsible for patrolling a large area. I assumed that range originally meant land – as in Home on the Range. Not so. In English, range first referred to a line of soldiers, or perhaps any line of people. The word arrange – to put things in order – is a cousin. Over time, the verb “to range” came to mean moving around a large area, and it’s evolved from there. It’s still a job, too – in the US, the National Park Service employs many, at parks, monuments, and historic sites. There are plenty of other uses, too. In 1933, The Lone Ranger galloped into homes via the radio. The show’s origins are murky, but the name probably comes from a Zane Grey novel, The Lone Star Ranger, dedicated John R. Hughes. More on him later. It was the story of a cowboy hero, and it became a hit on the radio, and then on television from 1949 to 1957, with Clayton Moore as the masked man. Books and movies followed, the most recent in 2013. 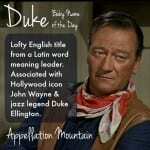 The character is an American icon, instantly recognized by many. The name takes on a more outdoorsy vibe with the title of the National Wildlife Federation’s magazine for children, Ranger Rick, first published in 1967. Rick is a raccoon, whose mission is to encourage children’s interest in the environment. Rick, along with friends Scarlett Fox and Boomer Badger, appear in cartoons and stories throughout the magazine. More than anything, this name brings to mind men in uniform. Sports teams use it, including a Texas Major League Baseball team. It’s been the name of a US military units since the American Revolution, and similarly named units are found all over the world. An elite combat leadership course in the US military is called Army Ranger School. But the best known use of the name might be the Texas law enforcement agency known as the Texas Ranger Division, and referred to informally as the Texas Rangers. It was established way back in 1823 by Stephen Austin, who led the first successful attempts to colonize Texas. They’ve handled all sorts of assignments since then, from protecting the original settlers to bringing in Bonnie and Clyde. They’re the state’s bureau of investigation. John R. Hughes, the model for the radio-turned-television masked man? He was a member of the division. More recently, Chuck Norris starred in Walker, Texas Ranger, a CBS hit that debuted in 1993 and ran for eight more seasons. It’s internationally popular, and Will Ferrell’s NASCAR spoof Talladega Nights: The Ballad of Ricky Bobby gave the names Walker and Texas Ranger to Bobby’s boys. 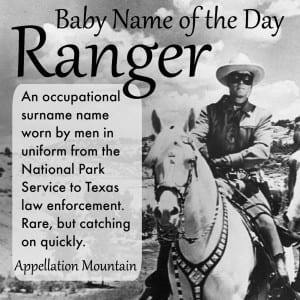 Ranger fits with our affection for ends in -r surname names for boys, as well as our preference for rugged, even aggressive, choices. Warden, a name with a similar meaning, has seen some use. And the numbers suggest that this name is on the way up. There were just 53 newborn boys given the name in 2014, but that’s a big increase from 12 in 2004. If you’re after an outdoorsy name for a son with a capable vibe, this is one to consider. It’s less preppy than Parker, but not as wild as Rowdy. What do you think of Ranger? Does it seem like a baby name, or is it best left to the organizations that use it? Blogger Heather Armstrong of DOOCE has a brother named Ranger and a sister named September. I guess her parents were into the ‘er’ sound. 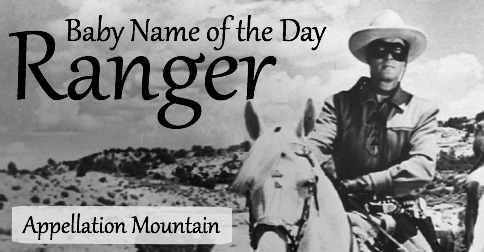 For the most part, I’m really into word names and some title names, but Ranger doesn’t do it for me. I think it’s a fine name though and wouldn’t cringe if I heard it. I’m afraid that my tone in this comment might be perceived as snarky. That wasn’t my intention. Ranger’s a nice name and so are Heather and September. Maybe it’s time for a September notd update? I really want to love it. After all, I’m the woman who was going to name this soon-to-be-born baby Badger, had she been a he. I like a wide variety of names. But . . . something doesn’t quite mesh for me. I think it should feel like a name but it doesn’t. It feels like a title. Anyway, I wouldn’t bat an eye at someone else using it, but I wouldn’t use it for my own child. Hmmm… I’ve known men named Captain and Doc. Folks are naming their sons Judge and Duke. I think Ranger could work really well (especially in a profession where people are called by their surname). Funny enough, the only Ranger I know is a woman in her mid thirties! It suits surprisingly well. I can see the issues Emmy describes being a deterrent, but I can’t help but like it for sound alone. That being said, it’s squarely in “for someone else” territory for me. I find Ranger aesthetically appealing, but I don’t think I would use it on an actual child, simply because the chances of it becoming awkward in their adulthood are too high. Unlike most profession names, Ranger is still a job title in common use across several industries, as you mentioned. If you name your child Cooper, Chandler, or Mason, you can be reasonably certain he isn’t going to wind up awkward explaining to people that no, he really is Cooper the Cooper in his barrel-making studio. But a boy named Ranger might actually grow up interested in working for the national park service, law enforcement, or the army, and then things get weird. In the army in particular, being *named* Ranger would catch him constant flack- becoming an army Ranger is hard work that only a small percentage of the people who qualify to try actually achieve, and an accolade . Having it as a name would be a bit like showing up to the navy with the first name SEAL, or being a would-be politician named Senator, or a med student named Doctor. Just awkward.